Peace and Sport and Licra Monaco joined forces to organize a symbolic day under the High Patronage of His Serene Highness Prince Albert II of Monaco, Friday March 29, as part of the Week of Education and Action against Racism and Antisemitism. In the morning, a tribute was paid to Josephine Baker, a figure of resistance to Nazism and of the fight against racism. Buried in the cemetery of Monaco, a neutral country, rich thanks to the diversity of its 141 nationalities, Josephine Baker had the deep conviction that the fight against racism should be a universal movement. 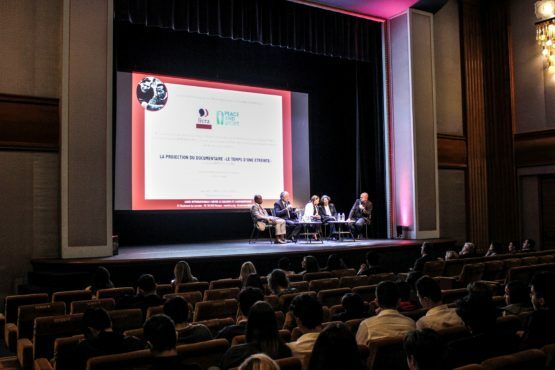 In the afternoon, a screening of the documentary “Jesse Owens and Luz Long: le temsp d’une étreinte” was proposed to the students of the University of Monaco and the students of the Lycée Technique and Hôtelier de Monaco, Lycée François Assisi and Lycée Albert 1er. Mr. Joël Bouzou, President and Founder of Peace and Sport and President of the World Olympians Association, Mr. Eric Fissore, President of Licra Monaco and Mrs. Anita DeFrantz, Member of the International Olympic Committee, Olympian and President of Tubman Truth Project intervened to feed the debate. The week of Education and Action against Racism and Antisemitism under the auspices of the UN was organized from March 18 to 24, 2019. It brings together the entire educational and pedagogical community, student organizations and high school students as well as associations engaged in the fight against discrimination, xenophobia, racism and anti-Semitism.